Bench Buddies, our petite pillow series, beautifully match our popular bench pillow patterns. All embroidery stitched within a 5”x 7” hoop. Class time: 10:00-2:00 pm. Bring a snack if you'd like. In this class, learn to applique, paper piece in the hoop and add cute embellishments (hint - in the hoop) and machine piecing. 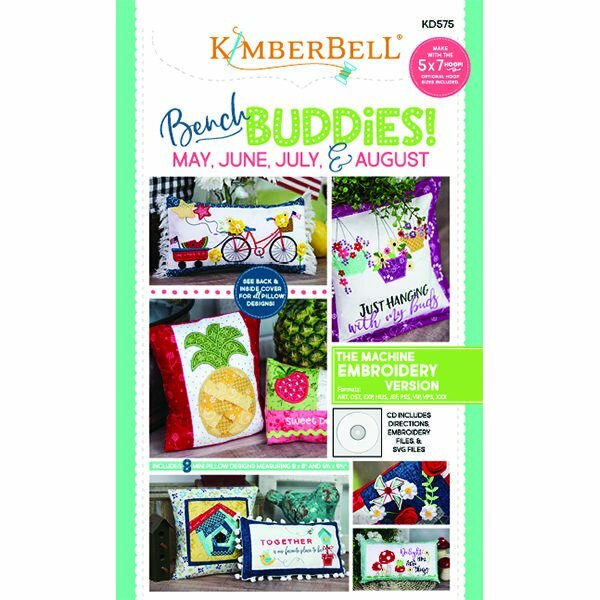 Create a bench buddy pillow with these cute whimsical design each month! Finished size: bench pillow form 8" or 9 1/2" x 5 1/2"
Materials list will be emailed prior to class. Requirements: Embroidery machine with a hoop 5"x 7", Must have Bench Buddies Embroidery CD in possession.